Grand Canyon University keeps growing — academically, spiritually, athletically, communally, dimensionally. The vibe was vibrant throughout 2014, and that’s reflected in the University’s top 10 stories of the year. The growth can be seen just by walking around or driving past the campus. It can be seen in the development of new programs and initiatives, both inside the halls of academia and in the nearby community. It can be seen in GCU’s continuing ascension in Division I athletics. More than that, it can be felt. Things are happening. Things are moving. Lopes Up is more than just a catchy thing to do at a basketball game. It reflects a feeling that something is brewing, something is growing. Everything is up, up, up … except tuition, that is. There were a lot of candidates for the top GCU headlines of the year, and whittling it down to 10 was so difficult some of the categories involve multiple stories. No surprise: They just kept growing. ● The trek into tech: The College of Science, Engineering and Technology (CSET) becomes GCU’s eighth college, and the University introduces programs in computer science, information technology and engineering (with emphases in biomedical, electrical and mechanical engineering) to address Arizona’s tech workforce needs. In December, GCU President/CEO Brian Mueller visits Washington, D.C., as the University is recognized by the Obama administration for its development of the new STEM Scholars program to provide college tuition credit to high school juniors and seniors. GCU also partners with Midwestern University in Glendale to guarantee medical school spots for worthy CSET graduates. ● Redevelopment plan announced: GCU embarks on a five-point plan to restore west Phoenix through (1) a unique partnership with Habitat for Humanity to repair dozens of homes in the University’s neighborhood; (2) an ongoing initiative with the Phoenix Police Department to improve public safety; (3) the creation of jobs and commerce on the main campus and along the Camelback corridor; (4) the development of a trained workforce in the areas of science, technology, engineering and mathematics (STEM) in CSET, and (5) the support of K-12 students at neighborhood schools. ● Widespread expansion: In the largest year of growth yet for GCU, a record enrollment includes nearly 11,000 students on campus (5,500 new) and more than 50,000 online. To accommodate the growth, the University holds its first winter commencement. More students also means more construction, and GCU adds three new dorms (Mesquite, Papago and Ocotillo), another classroom building and a second parking garage along with two more campus eateries (Qdoba and Mojo Bowl) and a 3,000-seat upper deck Arena expansion. Construction also begins on classroom buildings for engineering and the Center for Worship Arts, four more student dorms and another parking garage. The University also intends to convert nearby Maryvale Golf Course and a local hotel into first-class facilities. ● The Colangelo effect: The College of Business is named after Jerry Colangelo, who helped turn Phoenix into a major league city in ways that extend far beyond sports. True to his spirit and nature, Colangelo makes his presence felt on campus with a series of classroom visits, including his first meeting with graduate students. ● New dean, new programs in CCOB: Not only does the Colangelo College of Business get a new name, it gets a new dean — Dr. Randy Gibb, a retired colonel who logged 26 years in the Air Force. The college embarks on a plethora of new programs with an emphasis on entrepreneurship and servant leadership. ● Center for Worship Arts: GCU makes headlines in the Christian entertainment world, and not just with the creation of its Center for Worship Arts. Equally impressive is the center’s new director: Bart Millard, founder and lead singer of one of the top Christian bands, MercyMe. ● Change pondered in business model: GCU considers returning to nonprofit status, which it held from its founding in 1949 until 2004, to better ensure the long-term stability and legacy of the institution. ● Sports success: GCU gets off to a strong start in its first year in NCAA Division I by winning two Western Athletic Conference championships (regular-season softball, indoor track and field), finishing third in the WAC in both men’s and women’s basketball and second in baseball, and expanding its basketball schedules to include games against big-name opponents Kentucky and Indiana (men) and Louisville (women). Mike Vaught is named the new vice president of athletics. ● Global missions expand: GCU sends a record number of students — 233 — to 16 countries on five continents to show God’s love, preach the Gospel and experience other cultures through its Global Outreach Ministry. ● Tuition kept low: GCU freezes tuition for the sixth straight school year, which is unheard of in today’s climate of rising higher education costs. The commitment to affordable, high-quality education ensures the University’s mission to keep college accessible to all socioeconomic classes. 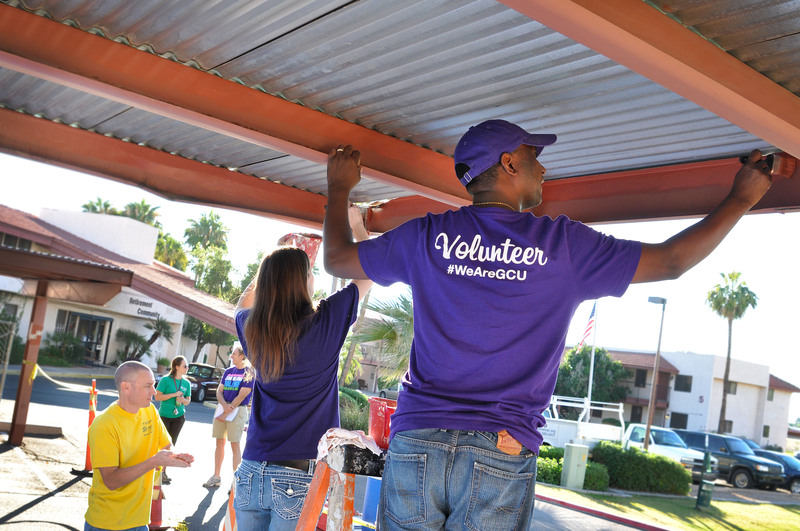 A part of GCU’s growing influence is that it has created a unique Sense of Place as a college town in West Phoenix, close to Maryvale region. If GCU constructs the overpass above the 27th Avenue to connect the 27th Avenue facility with the existing GCU main campus, it will further the Sense of Place of a college town. In fact, GCU may expand its current campus beyond the limitation of present streets by constructing more overpasses above the streets of Camelback Road, 35th Ave, and W. Missouri Ave. All of the GCU overpasses shall carry GCU signs on them. Thus, travelers using 27th Ave, Camelback Road, 35th Ave, and W. Missouri Ave will drive/walk under the GCU overpasses and easily observe GCU signs with a Sense of Place. In fact, the GCU overpasses shall be designed with capacities to allow small-sized campus security and maintenance vehicles to drive on top. GCU overpasses shall be restricted for campus students, faculties, and staffs use only. The GCU overpasses shall also connect all fenced university facilities that are divided by public streets/Right of Ways. Best wishes for the continued success of GCU in creating a unique Sense of Place!